From July 5 to 13, 2018, six students from San Antonio, Texas area high schools and their chaperone, journeyed to Kumamoto, Japan, the sister city of San Antonio. 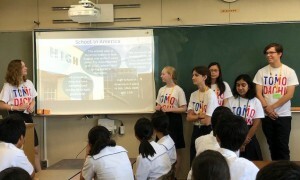 Their nine-day trip was implemented by the National Association of Japan-America Societies as part of the TOMODACHI NAJAS Grassroots Exchange Program. The students had an opportunity to stay with local Japanese host families for the first few days of their trip. As they immersed themselves in Japanese language and culture, the students reached a new understanding about their host country. The students also had an opportunity to visit and attend classes at a local high school. 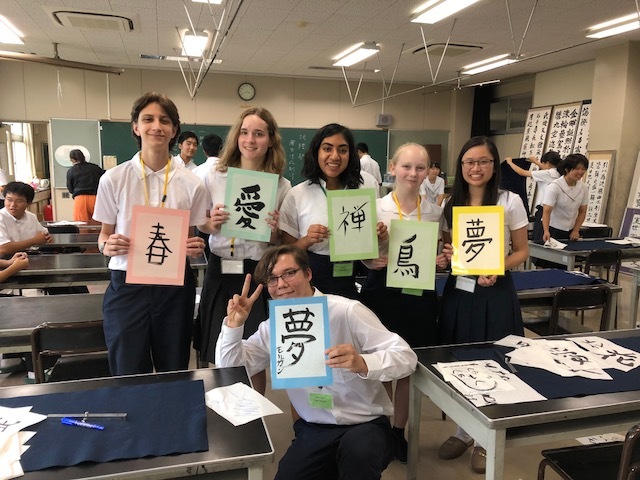 In addition to observing English, math, Japanese history, and chemistry classes, the students also participated in after school club activities such as calligraphy and a tea ceremony lessons. While in Kumamoto, the students had an opportunity to meet with the Vice Mayor of Kumamoto. Afterwards, students explored downtown Kumamoto to shop for local goods and see the famous Kumamoto-jo Castle, where they had a great time sightseeing and practicing their conversation skills with locals at souvenir shops. On the last evening, students were invited to a farewell party that marked the end of their home stay, where each student shared their wonderful experiences during the trip. A chance to learn the Japanese language and culture firsthand proved to be once-in-a-lifetime opportunity for the students. The students reflected on how thankful they were for the opportunity and how they have already started missing their Japanese host families and traditional Japanese foods. They eagerly hope to travel back to Japan in the near future in order to continue serving as a bridge between Japan and the United States. Thanks to the support of local host families, Kumamoto Kita High School, and the Japan-America Society of Kumamoto, the students had a life-changing experience that broadened their horizons and helped them become cultural ambassadors.